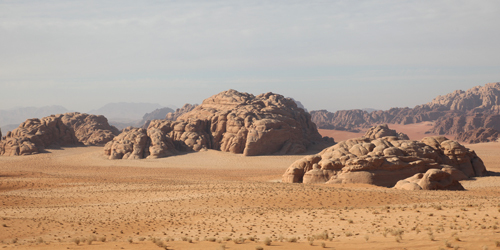 If you are looking for an unforgettable day in the desert of Wadi Rum then you can find some great options in the following. 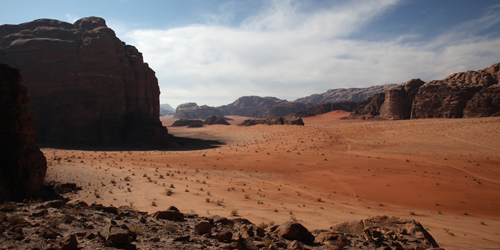 "A day with a Bedouin"
Start with our guide in a 4x4 from Wadi Rum village to the most important sights of our beautiful desert Wadi Rum e.g. Lawrence's Spring, Wadi Um Ishrin, Jebel Anafishiya, Lawrence's House, Barragh Canyon, Jebel Burdah, Um Fruth Bridge and Khazali Canyon. Including lunch, dinner and an overnight stay in the desert. 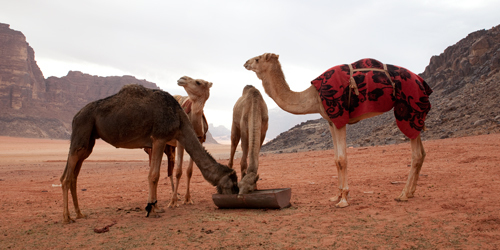 We offer several routes for camel rides and include the places you particularly want to see. You can just talk to us and we will work it out. 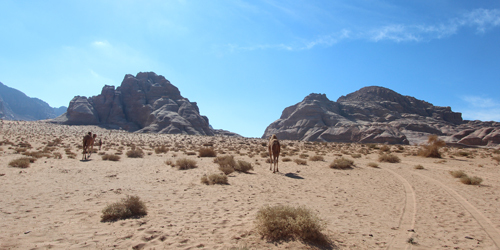 You find the fixed prices below and we arrange a personal and of course guided camel tour for you - all of Wadi Rum is sufficiently beautiful. The tour starts with our guide from Rum village by jeep and it is basically the same route as the "classic trip". 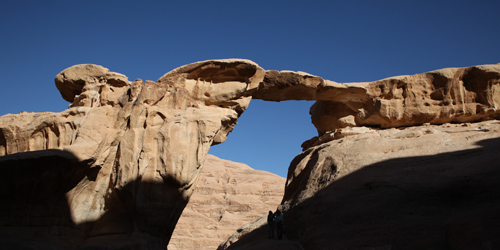 You will go hiking through Barragh Canyon, on Jebel Burdah and walk through a beautiful narrow valley which leads to another rock bridge. This is a short version of the "Three Bridges Trek" and only takes one day. Lunch, dinner, overnight in the desert included. Recommendable for those who are looking for easy hiking without going up into the mountains. There are many great routes that we do regularly, depending on the available time, weather and other factors. The hike takes around 5 to 6 hours, for most people this would be 12 to 18 km. 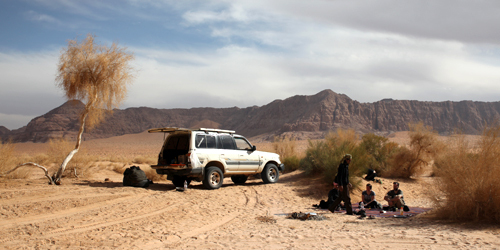 Jeep, guide, lunch, dinner and an overnight stay in the desert included. 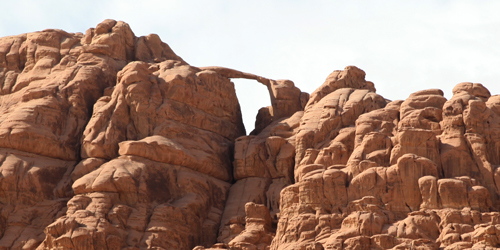 Burdah Arch is one of the best known and the most spectacular sites in Wadi Rum. It's situated about 300 meters above the sand and the view from it is magnificent. You'll see Lawrence's Spring, the red sand dunes in Wadi Um Ishrin, Jebel Anafishiya, Barragh Canyon. Including lunch, dinner and an overnight stay in the desert. 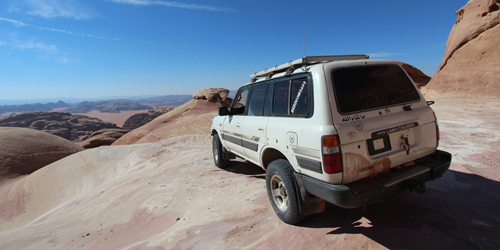 Drive 40 km through the desert to the south to Jebel Um Adaami, the highest mountain in Jordan (1.832 m above sea level). It's a guided hike to the top with rough hill walking over rocky ground. 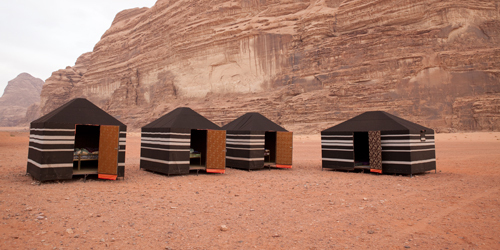 Expect a terrific panoramic view over Saudi Arabia and Wadi Rum. Later we'll cross Wadi Saabit. Including lunch, dinner and an overnight stay in the desert. Starting from Rum village, we head south on foot towards the sand dunes in Wadi um Ishrin. After that we continue down the other side and through a series of narrow canyons to Lawrence's House close to Jebel Raka. It should take us about 6 hours. Including lunch, dinner and the overnight stay in the desert. This program is designed to offer small parties a real "desert experience" in an afternoon and an overnight. Start at 2 or 3 pm with a jeep tour into the "wild parts" of the desert, enjoy a traditional dinner at night and sleep under the stars. Including all food, guide, services and sleeping equipment. Minimum 6 people. 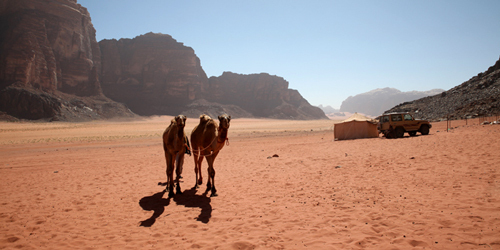 If you are looking for more than just one day or one day and one night in Wadi Rum there are a number of possibilities that can be added on to any of the other trips. Look as well for our two day programs and three and more day programs. If you are traveling alone please send us a message and we will try our best to find a tour you can join to reduce the costs and make it as comfortable for you as possible. You can find our general information about our tours here.